EL MONTE – Columbia School seventh-grader Nohelia Vega is a natural tinkerer – she likes to build things and dreams of a career in engineering because she wants to use math and science to solve the world’s problems. When Vega learned that she could study engineering and coding through El Monte City School District’s new robotics program, she saw it as a perfect pathway to her career goals. The robotics program, which is part of the District’s Gifted and Talented Education (GATE) program, was launched in January by GATE lead teacher Cynthia Diaz. Of the 350 students enrolled in the District’s GATE program, 80 are involved in robotics, working in two teams of 40. Diaz said her GATE students have made great strides in the short time the program has been underway – some have conquered their fear of math while others have developed their leadership skills. During weekly Saturday sessions, students learn how to build robots from Legos and code using Lego NXT and EV3 programs to control robots. The program also goes beyond coding and engineering – it teaches students how to research and how to deliver oral presentations. Diaz said teaching students about robotics and professional behavior is a great way to prepare them for a future in which the robotics industry will play an increasingly significant role. “The reality is that the jobs we know right now are going to be gone in 20 years and our students need the chance to gain experience and be ready for this future,” Diaz said. 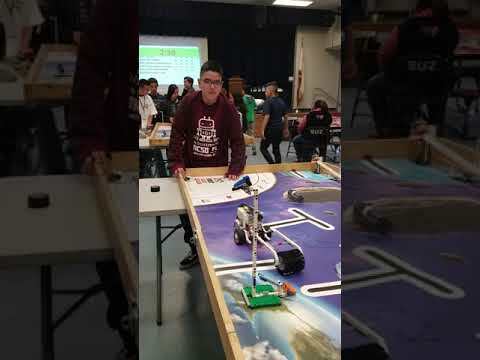 El Monte City School District sent 17 students representing its two teams to Suzanne Middle School on Nov. 10 to compete in a qualifying tournament hosted by the Los Angeles Region FIRST Lego League. Students were scored on their ability to research and present solutions for problems that affect astronauts and on how well their robots performed tasks such as moving objects and driving over different terrain. One of the District’s teams earned a second-place project award for suggesting that astronauts practice meditation to combat mental instability during long-term space missions. Diaz said her next goal for the robotics program is to double the number of robotics teams in the District from two to four by August 2019. She said the overall goal is to have at least one team at each of the District’s schools. EMCSD_ROBOTICS1: Wright School eighth-graders William Mora, right, and Henry Camarena ready their robot during the Los Angeles Region FIRST Lego League robotics tournament at Suzanne Middle School in Walnut on Nov. 10. 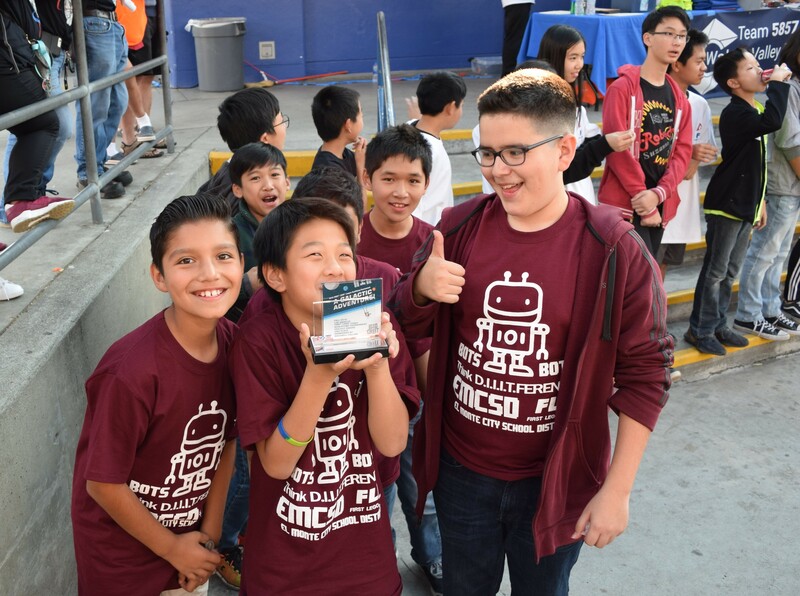 EMCSD_ROBOTICS2: El Monte City School District’s robotics program students hold up a second-place project award for their research and presentation about how astronauts can practice meditation to combat mental instability during space missions. 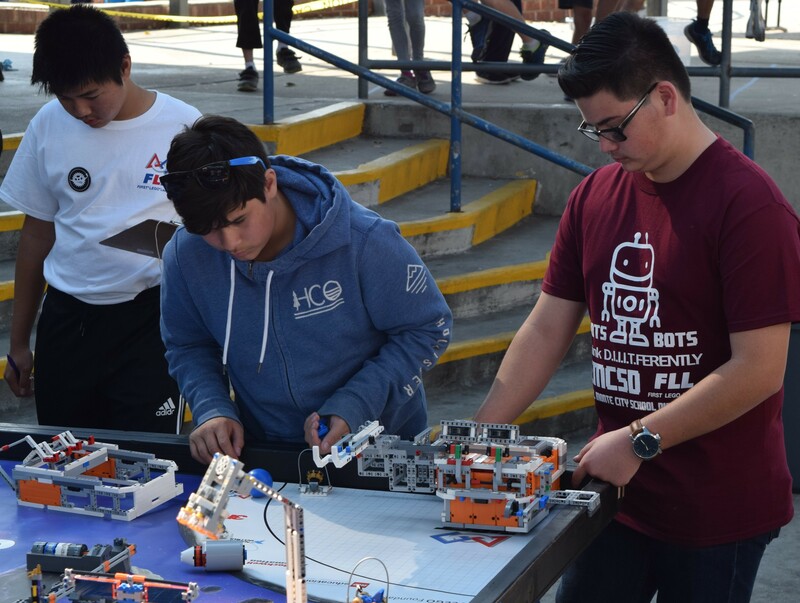 The students competed at the Los Angeles Region FIRST Lego League robotics tournament at Suzanne Middle School in Walnut on Nov. 10. El Monte City School District’s robotics program students hold up a second-place project award for their research and presentation about how astronauts can practice meditation to combat mental instability during space missions. The students competed at the Los Angeles Region FIRST Lego League robotics tournament at Suzanne Middle School in Walnut on Nov. 10. Wright School eighth-graders William Mora, right, and Henry Camarena ready their robot during the Los Angeles Region FIRST Lego League robotics tournament at Suzanne Middle School in Walnut on Nov. 10.